Disney has a deep history. From Mickey Mouse’s first appearance on the silver screen back in 1928, all the way to Frozen’s wild success in 2013, it seems like everything that Disney touches turns to gold. Seeing the latest Disney movie has almost become a rite of passage for families, so it’s no surprise that even kids seem to have a wealth of Disney knowledge under their belt. 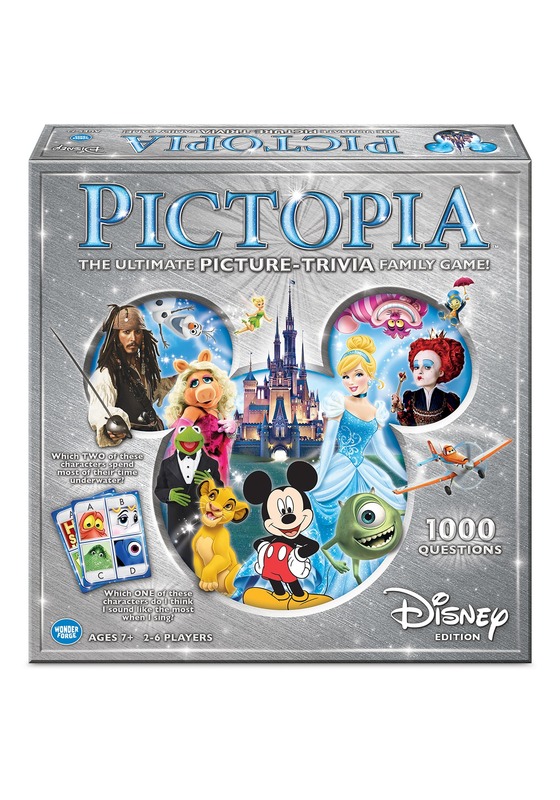 Pictopia: Disney Edition is a game that puts the family’s knowledge of animated films to the test! This Pictopia: Disney Edition Board Game comes with everything you need to have one fun-filled family game night. It comes with 200 cards, scoring dials, wager coins, a game board, game pieces, a die, and instructions to play. It’s intended for ages 7 and older, and it plays 2 to 6 players. Gameplay revolves around Disney trivia. Players take turns being the “host”. The host plays a card from the deck, which will have pictures on one side and hidden questions on the other side. The rest of the players wager coins on whether or not they’ll be able to get the questions right. Once everyone has wagered their coins, the host asks questions and all players work together to get the answers right. Get them all right, and you’ll get to move your pawn forward. The first player to the end wins!